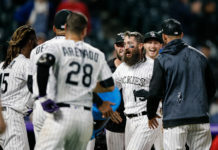 No time machine is coming anytime soon for the Colorado Rockies as their struggles to open the 2019 season continued Monday night. In the first of a three-game series against Atlanta, the Rockies battled but lost to a streaking Braves squad, 8-6. The Braves came into the contest having won five of their last six games, while the Rockies had just one victory in their last nine games. Both of those streaks went up by one Monday, with the Rockies falling once again. Let’s dive into what happened at Coors Field in the club’s latest lapse. The Rockies have yet to score in the first inning this season, which continued against Atlanta. To make matters worse, the Rockies have not scored in the second inning either. Colorado has scored six times in the third inning this season and three of those came on Sunday against Los Angeles. The point is, the Rockies are struggling to score early in games and it is affecting them for the six innings that follow. Struggling to score early in games causes the Rockies to press at the plate, which has not worked until tonight. Monday night is a perfect example as Atlanta scored four runs in the games first three innings — including a two-run home run by Ronald Acuna Jr. — while the Rockies did not record a single hit. The Pheñom with the flex. The Rockies first hit did not come until the fifth inning when Josh Fuentes drove a single up the middle. That was the start of what ended up becoming a special inning for Colorado. The fifth inning was a special one for the Rockies as they went into the frame down 7-0 and walked out of it with a one-run deficit. Colorado’s rally began with a Fuentes single, which was followed by a Pat Valaika double. Garrett Hampson hit a sac-fly to drive in Fuentes, which Colorado followed with a pinch-hit two-run home run by Mark Reynolds. Reynolds home run helped keep Colorado’s rally stay alive, which came to fruition once Trevor Story hit a three-run home run just a few batters later. That was Story’s fourth home run of the season and Colorado’s second of the inning as they were officially back in the game. Even though the Rockies struggled in the first couple innings, they were able to overcome that with a tremendous fifth inning to get them back into the game. Not all starts are going to be great for Freeland and Monday night is a prime example of that. Freeland opened the season with a tremendous outing in Miami — a game Colorado won — and followed it up with an okay performance in Tampa Bay. Against the Rays, Freeland gave up two earned runs and struck out 10, but still ended up taking the loss. 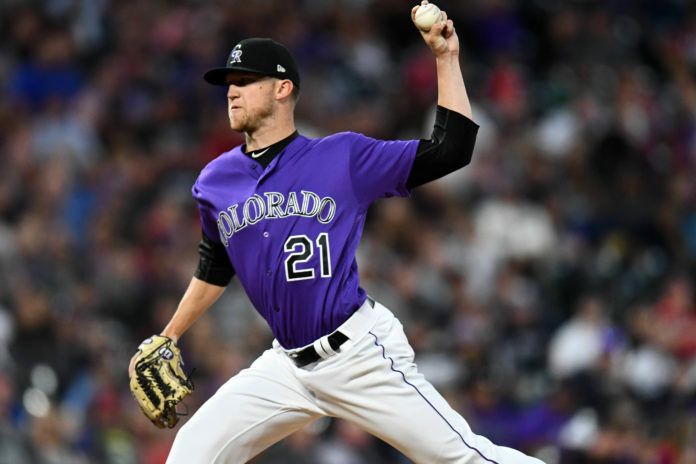 The Rockies ace was looking to get back on track against the Braves, but the opposite happened as he ended up allowing seven earned runs in five innings pitched. It took Freeland 91 pitches to get through five innings as he walked four hitters while striking out a season-low three. Monday’s start should have no effect on Freeland moving forward as he just ran into a solid Atalanta lineup. The Braves have been playing phenomenal baseball to start the season and Freeland experienced that first hand. Freeland will look to bounce back on Saturday when he is slated to start against the Giants in San Francisco. When the Rockies were down 7-0 in the bottom of the fifth inning, it seemed as if all hope was lost. Then, Colorado proceeded to score six runs in the bottom half of the inning to make it a one-run game through five innings of play. Still, the Braves were able to hold the Rockies scoreless to close the game and tacked on one run of their own. 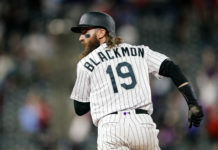 Even though the Rockies were not able to come out on top, there were some positives that came from Monday nights loss. The offense was certainly one of them as Colorado scored six runs for the third time in four games. The only bad part is all those games ended in a loss as the Rockies still have not found a way to compliment solid pitching, with good hitting and vice versa. The Rockies will look to snap their four-game losing streak tomorrow night when they face the same Braves team at 6:40 p.m. MST.